“Be liberal in what you accept from others, conservative in what you accept from yourself.” Postel’s Law. A hard statement something like “A script must be between 90 and 120 pages.” That’s a rigid thought, rigidly stated, and it pisses people off because no one likes it when jerks are right. The gentler way to say that is, “A script should be as long as it takes to tell a good story, but 90-120 is a safe range (but by no means a dogmatic one).” Hard ideas are softened by qualifiers. Of course this is a happy medium as well. It’s possible to so neuter a phrase with weasel words that it comes out with such a limp-wristed toss that it never gets close enough for anyone to catch it. 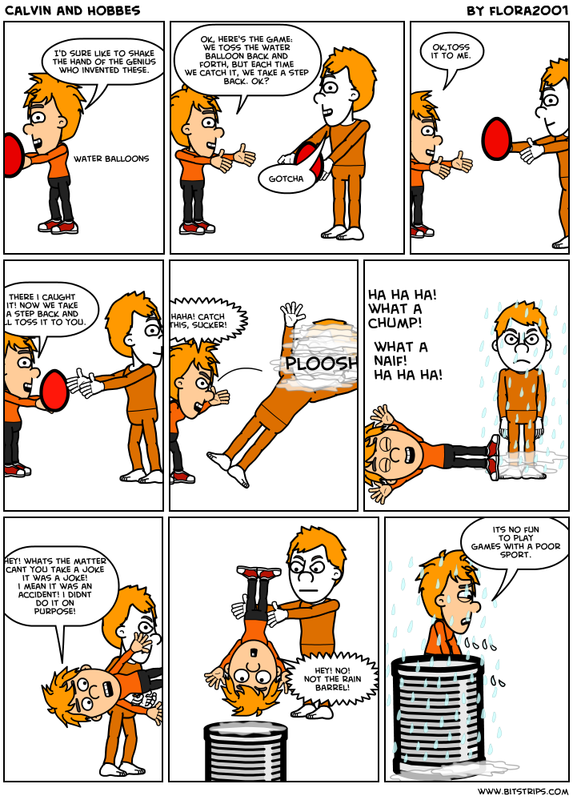 I wanted the cartoon where Calvin suggests that they have a water balloon catch, but it’s a trick and then he throws it right at Hobbes. This is the best google could do. Be a good listener. When you hear something you don’t like, imagine that the speaker prefaced it with “In my humble opinion” and added a footnote like, “Obviously there are exceptions to every rule.” NOTE: Perform this key step inside your head, saying stuff like this out loud is not a good way to win friends or influence people. On the other other hand, I can’t believe I had to write 500 words to explain Postel’s Law! Argh, why can’t people get things faster!!!!! Whyyyyyy??? Writing is communication is writing is communication. Good writers are curious, self-aware, and have an irony and wit and humor that informs their world view and shines in their writing. The best role models in this respect are people who believe the opposite things that you do, and can still write in a way that reaches you (even the staunchest atheists seem to like Stephen Colbert, Fred Rogers, Roger Ebert and Stephen King). 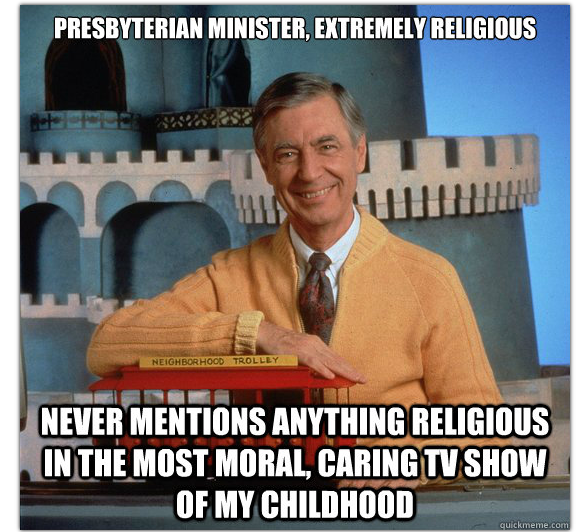 People don’t get much more religious than Fred Rogers. And yet every hostile atheism board is littered with tributes like these. When someone reacts to a simple suggestion on a forum with an acidic, 500-word screed, I wonder how happy they are in their real life and I wonder if their overflow of bile is also present at toxic levels in their scripts. Thanks for catching what I’m throwing. I’d love it if anyone tossed a comment back my way. I will endeavor to catch it gently. PS – The cynics out there might question why you’d participate in an egg toss in the first place. This is a valid question. Q: When is the most popular day to start a screenplay? A: Tomorrow?